Finally, a jump rope that is just your size, sold by the each this jump rope adjusts from 8 foot long to whatever length that you finally need. 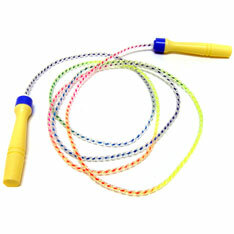 Also, this jump rope will not get tangled – with spinning handles you will never have to deal with a jumbled up jump rope. $1.05 each for 96 or more. $0.90 each for 192 or more.